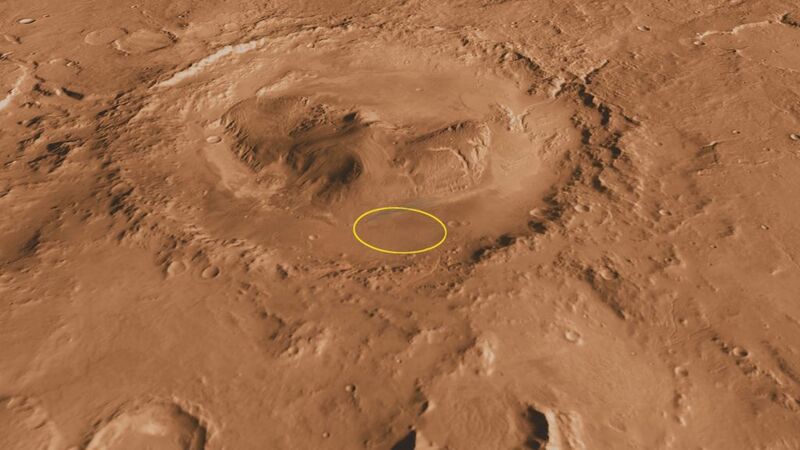 PASADENA, Calif. — NASA’s next Mars rover will land at the foot of a layered mountain inside the planet’s Gale Crater. The US space agency made the announcement Friday, July 22. The car-sized MSL (Mars Science Laboratory), or “Curiosity,” is scheduled to launch late this year and land in August 2012. The target crater spans 96 miles (154 kilometers) in diameter and holds a mountain rising higher from the crater floor than Mount Rainier rises above Seattle. Gale is about the combined area of Connecticut and Rhode Island. Layering in the mound suggests it is the surviving remnant of an extensive sequence of deposits. The crater is named for Australian astronomer Walter F. Gale. In 2006, more than 100 scientists began to consider about 30 potential landing sites during worldwide workshops. Four candidates were selected in 2008. An abundance of targeted images enabled thorough analysis of the safety concerns and scientific attractions of each site. A team of senior NASA science officials then conducted a detailed review and unanimously agreed to move forward with the MSL Science Team’s recommendation. The team is comprised of a host of principal and co-investigators on the project. Curiosity is about twice as long and more than five times as heavy as any previous Mars rover. Its 10 science instruments include two for ingesting and analyzing samples of powdered rock that the rover’s robotic arm collects. A radioisotope power source will provide heat and electric power to the rover. A rocket-powered sky crane suspending Curiosity on tethers will lower the rover directly to the Martian surface. This entry was posted in Uncategorized and tagged Curiosity, Mars, MSL, NASA. Bookmark the permalink.